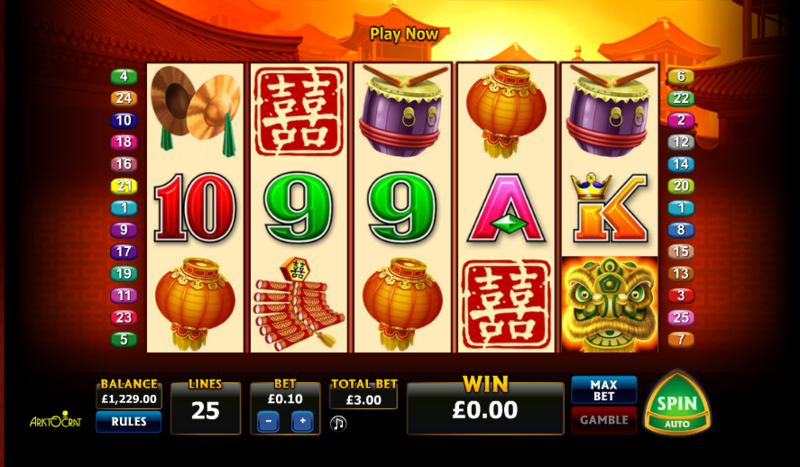 Once more it’s time to pack our bags and board a virtual long haul flight to the mysterious orient; this time it’s to check out Double Happiness, an online slot from Aristocrat Leisure/NextGen Gaming which features an interesting bonus feature and an opportunity to gamble your winnings. Read the full review below for more information. 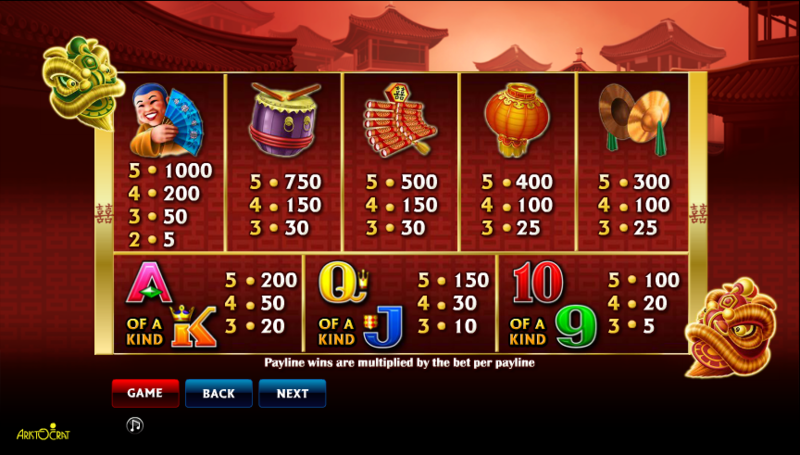 Double Happiness is a five reel slot with three rows and twenty five fixed paylines; the reels are set against an atmospheric background featuring Chinese structures in front of a glowing sunset. There are theme-related five high value symbols including a fan-wielding monk, a drum, fie crackers, Chinese lanterns and symbols. The lower values are the standard 9, 10, J, Q, K and A. The wild symbol is represented by a golden dragon and it will replace all others except the scatter; the scatter is the Double Happiness symbol which activates the main feature. Once the free spins start the Roaming Wilds make an appearance and these are two wild symbols which appear on the first spin and then move one place on each subsequent spin. This clearly increases your winning chances and if they end up on the same position and contribute to a win it’s also worth a 10x multiplier. Additionally landing a scatter symbol below a roaming wild may award a scatter win. More spins can be re-triggered by landing more scatters during this round. Any win can be gambled by clicking the ‘gamble’ button below the reels; double or quadruple your win by guessing the colour or suit of the next card drawn – you have a maximum of five correct guesses but you’ll lose it all if you’re wrong. Double Happiness is a little dated and probably won’t make it into our top five oriental slots but it’s worth a few spins and there are some big wins on offer if you can trigger the free spins round.